In 2015, Postgres added support for ON CONFLICT DO UPDATE to their INSERT statements. Their docs say that using this syntax guarantees an atomic INSERT or UPDATE outcome; one of those two outcomes is guaranteed, even under high concurrency. Now, that is one amazing feature isn’t it? Postgres worked really hard to include that feature and kudos to them. I would trade ten features like stretch db for one feature like this. It makes a very common use case simple. And it takes away the awkwardness from the developer. But if you work with SQL Server, the awkwardness remains and you have to take care of doing UPSERT correctly under high concurrency. 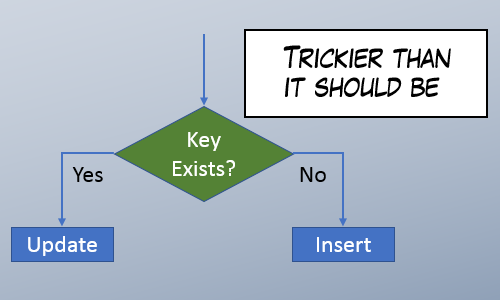 I wrote a post in 2011 called Mythbusting: Concurrent Update/Insert Solutions. But since then, I learned new things, and people have suggested new UPSERT methods. I wanted to bring all those ideas together on one page. Something definitive that I can link to in the future. Unfortunately, under high concurrency, this procedure fails with primary key violations. The MERGE statement still suffers from the same concurrency issues as the vanilla solution. Primary Key violations are still generated under high concurrency. Even though it’s a single statement, it’s not isolated enough. I want to mention one more bad solution before I move on to the good solutions. It works and it’s interesting, but it’s a bad idea. So what are some better solutions? This is a solid solution, but every implementation is different so every time you use this pattern, test for concurrency. Nice, but be careful with MERGE statements. For alternative syntax, skip the SET TRANSACTION ISOLATION LEVEL SERIALIZABLE and include a lock hint: MERGE dbo.AccountDetails WITH (HOLDLOCK) AS myTarget. -- ignore duplicate key errors, throw the rest. I wrote a post about it in Ugly Pragmatism For The Win. 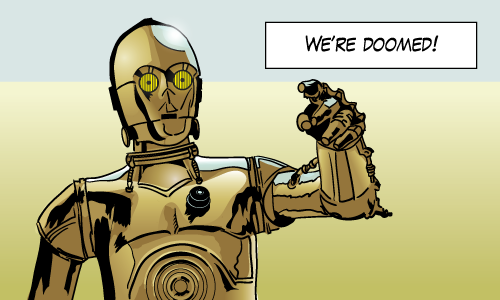 And I wrote about a rare problem with it in Case study: Troubleshooting Doomed Transactions. I have no concurrency concerns here but because of this issue – not to mention performance concerns – it’s no longer my first preference. When describing each pattern so far, I haven’t paid attention to performance, just concurrency. There are many opportunities to improve the performance of these solutions. In particular, pay very close attention to your average use case. If your workload UPDATEs a row 99% of the time and INSERTs a row only 1% of the time, then optimal implementation will look different than if the UPDATE and INSERT frequency is reversed. 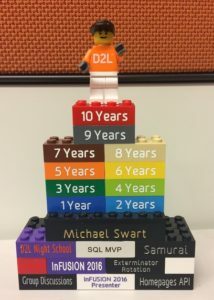 Today marks my tenth anniversary working for D2L and it also marks ten years since I specialized in databases full time. I’ve never worked anywhere this long. I always told myself that I’d stick around as long as there were new and interesting challenges to tackle and there’s no end in sight. So I thought I’d compile a list of things I didn’t know in 2007. A poorly performing database query can run orders of magnitude slower than a tuned query. Compare that to poorly performing application code. Improvements there are usually more modest. But this can work out. It makes you look like a genius. You get to brag how that report that once took 32 hours now takes 10 minutes. Even though that missing index suggestion in the query plan turned out to be right this time, take the credit, you deserve it. Speaking of appearing like a genius, here are three resources I still use when solving problems. dba.stackexchange, the DBA specific version of stack overflow. I’ve been writing here for nearly ten years. 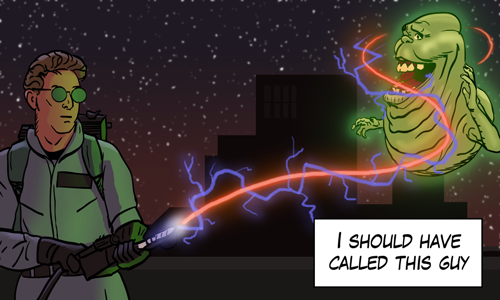 One day, I decided to include an illustration with each blog post. For some reason it makes each post just a little more compelling than a wall of text. Drawing has been a very rewarding hobby for me. I highly recommend it. City Cafe: Awesome bagels in the morning. If you’re in town, send me an email. I’ll introduce you to one of these places. Knowing normal forms is a lot less useful than I thought it would be. Normal forms are an academic way of describing a data model and it’s ability to avoid redundant data. But knowing the difference between the different normal forms has never helped me avoid trouble. I measured it on the QA box. The impact of a particular procedure or query on a server is simply the frequency of a query multiplied by the cost of that query. To reduce the impact on the server it’s often more valuable to focus on reducing the number of calls to that query in addition to tuning it. Look for duplicate queries. You’d be surprised how often a web page asks for the same information. Cache the results of queries that are cache-able. I rely on this one heavily. Consider techniques like lazy loading. Only request values the moment they’re needed. If you have multiple instances of a database then schema will drift over time. In other words, the definition of objects like tables, views and procedures will be out of alignment with what’s expected. The drift is inevitable unless you have an automated process to check for misalignment. We wrote our own but tools like Redgate’s Schema Compare can help with this kind of effort. Software will change over time and it requires deliberate attention and maintenance to remain stable. Watch production and look for expensive queries before they impact end users. When I type it out like that, it seems obvious. But the question really then becomes, how much time do you want to invest in preventative maintenance? My advice would be more. Not enough time means that your team gets really good practice firefighting urgent problems. I work directly with a dream team of troubleshooters. They’re smart, they’re cool during a crisis and they’re awesome at what they do. Fixing issues can be thrilling at times, but it pulls us away from other projects. And what do they say about people who can’t remember the past? Sometimes we have to relearn this lesson every few years. D2L values learning of course and that includes employee professional development. They have always supported my blogging and speaking activities and they recognize the benefits of it. The people I work with are great. I couldn’t ask for a better team. And we’ve got a decent mission. I’m really glad to be part of a team that works so hard to transform the way the world learns. Thanks D2L! You have my permission to skip this post. This one’s just for me. 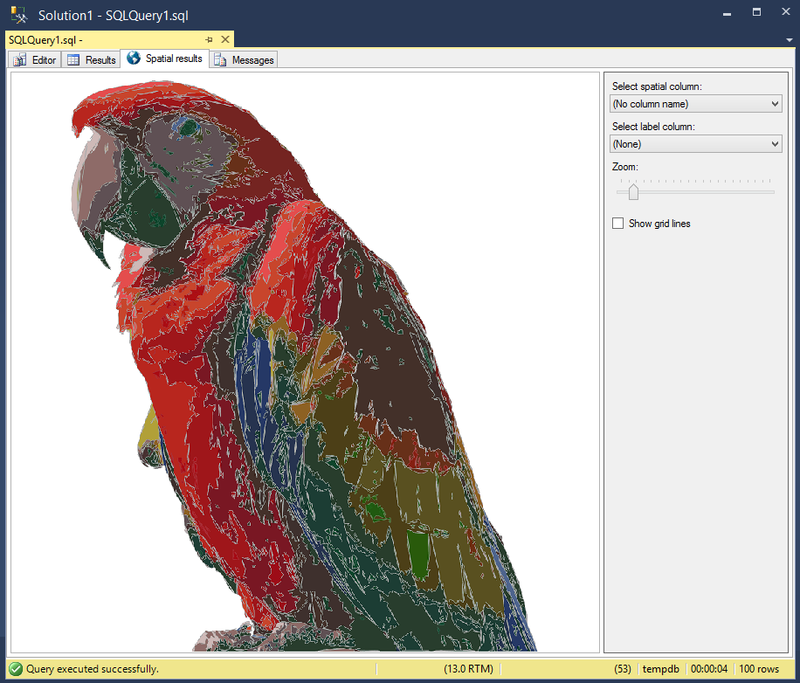 So I’ve been drawing again with SQL Server’s spatial results tab, the first time I posted something was with Botticelli’s Birth of Venus in More images from the Spatial Results Tab. Because it’s a stupid challenge and I wanted to see what I could do with it. 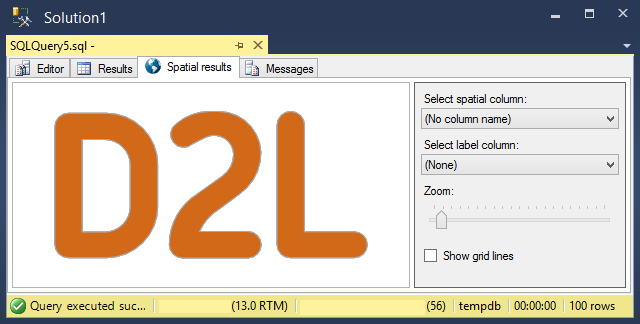 The SSMS spatial tab is a lousy crummy medium for images. It really is quite terrible and using SSMS to draw imposes restrictions and rules. It’s fun to see what I can do by staying within that framework. It’s something to push against just because it’s challenging. Others do crosswords, This week, I did this. I realized a couple things lately. I used to think the spatial results tab uses lousy colors, pastel and dull. I realized that they’re not dull, they’re just transparent. I can overlap polygons inside a geometry collection to get more solid colors. 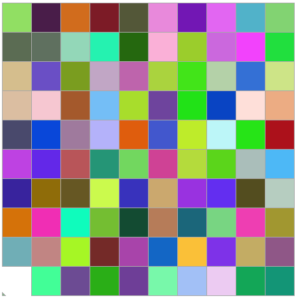 Here are the top 100 colors without transparency. I can use arc segments called CIRCULARSTRING. SVG files mostly use Bézier curves which cannot be translated easily to arc segments. For some reason, if you begin to use CIRCULARSTRING, then the transparent colors won’t blend with itself (just other colors). Also arc segments are rendered as several small line segments anyway, so for my purposes, it’s not a super feature. One last picture/query of a scarlet macaw. Click on it or any other picture in this post to get the query that generated it. My friend Josh came up with the term “dark queries”. Just like “dark matter”, dark queries can’t be detected directly, but their effect can still be observed. He’s talking about queries that aren’t stored in cache. If your monitoring solution relies heavily on the statistics of cached queries, then you may not be capturing all the activity on your server. but some queries will fall out of cache or don’t ever make it into cache. Those are the dark queries I’m interested in today. Today let’s look at query recompiles to shed light on some of those dark queries that maybe we’re not measuring. By the way, if you’re using SQL Server 2016’s query store then this post isn’t for you because Query Store is awesome. Query Store doesn’t rely on the cache. It captures all activity and stores queries separately – Truth in advertising! If you work with a high-frequency transactional workload like I do, then you can’t afford the CPU required for frequent recompiles. If you have sustained recompiles larger than a few hundred per second, that’s probably too much. It’s easy to check. Use the performance monitor to take a look at the SQL Re-Compilations/sec counter which is found in SQLServer:SQL Statistics/sec. Even if you don’t have frequent recompiles, it’s important to know what’s going on in the server. On your OLTP database, I bet you’re reluctant to let those BI folks run their analytical queries whenever they want. They may try to hide their shenanigans with an OPTION(RECOMPILE) hint. 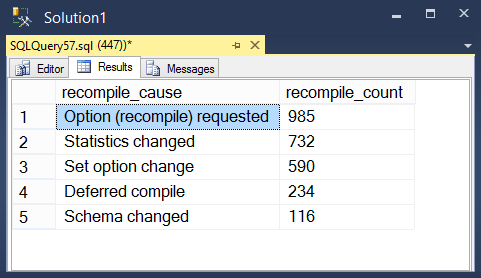 This extended events captures those query recompiles. Be sure to only capture a small sample by having the session run for a small amount of time. Or you can use the histogram above to make sure that the frequency is low. 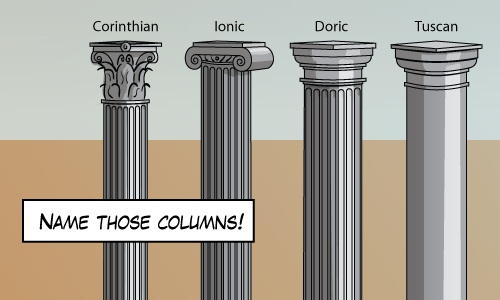 I’ve got a program here that finds SQL in procedures with missing column specifications. Even though they shouldn’t be. If you google “generating permutations using SQL”, you get thousands of hits. It’s an interesting problem if not very useful. I wrote a solution recently and thought I’d share it. If you’re keen, try tackling it yourself before moving on. 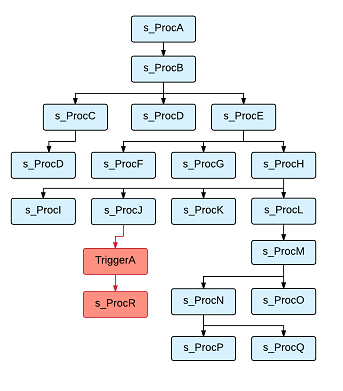 Notice the use of recursive CTEs as well as bitmasks and the exclusive or operator (^). 362880 rows (9!) in less than ten seconds. Let me know what you come up with. If you don’t feel like reading ahead, here are the lessons. Don’t program in T-SQL. Avoid triggers. Extended events are awesome. write to the log file. Roll back the transaction. Google pointed me to this Stackoverflow question where Remus Rusanu talks about doomed transactions. You’re not allowed to do work in a catch block if your transaction is doomed. He then points to more information about uncommittable transactions in the TRY/CATCH docs. According to the TRY/CATCH docs, you can get this kind of error when XACT_ABORT is turned ON. This is something we do and I wrote about why in Don’t Abandon Your Transactions. So there’s a CATCH block catching some error in a TRY block. Now I wonder what that error is. The SqlException that got raised to the client only had the 3930 error above. It had nothing about the original error. I did have the procedure name though. I can look there. So the procedure was complicated and it used explicit transactions, but I couldn’t find any TRY/CATCH blocks anywhere! What I needed was a stack trace, but for T-SQL. People don’t talk about T-SQL stack traces very often. Probably because they don’t program like this in T-SQL. We can’t get a T-SQL stack trace from the SQLException (the error given to the client), so we have to get it from the server. First I looked for the error. The one where error_code = 3930. I did it using Management Studio to view the session’s data. It doesn’t look too useful at first glance but you can get the actual SQL query using sys.dm_exec_sql_text. Here’s what I found. The original error was a PK violation in a procedure using the Just Do It (JDI) pattern. It’s a technique which tackles upsert concurrency problems by inserting a row and catching and suppressing any PK errors that might be thrown. So that’s where the TRY/CATCH block was. That’s why i didn’t see it before. I hate the way triggers can hide complexity. They’re sneaky. The CATCH block catches a real error and the XACT_ABORT setting dooms the transaction. Because I didn’t do anything with the error, the transaction was allowed to continue. It was actually some query in s_ProcM that attempted to do work inside the doomed transaction. To fix, we adjusted the text of the query to be concurrent without using TRY/CATCH for flow control. For the extra curious, we used method 4 from Mythbusting: Concurrent Update/Insert Solutions. 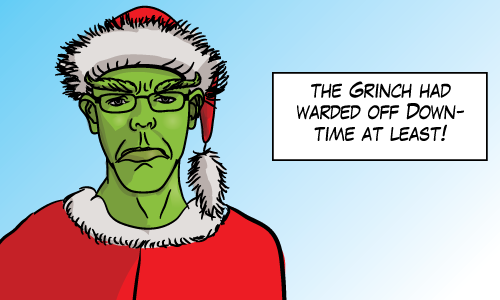 Merry Christmas readers! It’s story time. This is about a problem I encountered a few weeks ago. 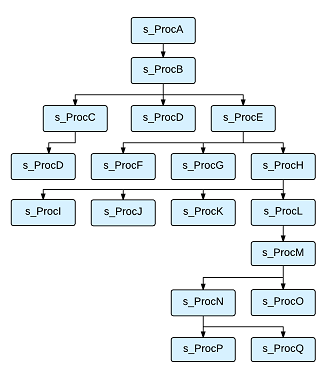 We were looking at a production site using sp_whoisactive and we noticed a lot of blocking on one particular procedure. I’m going to explain how we tackled it. In this case, I think it’s interesting that we were able to mitigate the problem without requiring sysadmin access. Using sp_whoisactive and other tools, we noticed several symptoms. SQLException timeout errors were reported by the app when calling one procedure in particular. Many sessions were executing that procedure concurrently. Or at least they were attempting to. There was excessive blocking and the lead blocker was running the same procedure. SQL Server was struggling to compile the procedure in time and the application wouldn’t let it catch its breath. The query optimizer was attempting to create statistics automatically that it needed for optimizing the query, but after thirty seconds, the application got impatient and cancelled the query. So the compilation of the procedure was cancelled and this caused two things to happen. First, the creation of the statistics was cancelled. Second, the next session in line was allowed to run. But the problem was that the next session had already spent 28 seconds blocked by the first session and only had two seconds to try to compile a query before getting cancelled itself. The frequent calls to the procedure meant that nobody had time to compile this query. And we were stuck in an endless cycle of sessions that wanted to compile a procedure, but could never get enough time to do it. Why was SQL Server taking so long to compile anyway? Kind of a perfect storm of factors that exposed a SQL Server quirk that caused long compilation times, timeouts and pain. Well, in this case, I think that the traceflag 2389, 2390 kind of outlived its usefulness (the cure is worse than the disease and all that). So the main fix for this problem is to get rid of those traceflags. But it would be some time before we could get that rolled out. So for the short term, we worked at getting that procedure compiled and into SQL Server’s cache. We called the procedure ourselves in Management Studio. Our call waited about thirty seconds before it got its turn to run. Then it spent a little while to compile and run the procedure. Presto! The plan is in the cache now! And everything’s all better right? Nope. Not quite. The timeouts continued. If you’ve read Erland Sommarskog’s Slow in the Application, Fast in SSMS you may have guessed what’s going on. When we executed the procedure in SSMS, it was using different settings. So the query plan we compiled couldn’t be reused by the application. Remember, all settings (including ARITHABORT) need to match before cached plans can be reused by different sessions. We turned ARITHABORT off in SSMS and called the procedure again. After a minute, the query completed and all blocking immediately stopped. Whew! The patient was stable. Do You Have Check Constraints On Your Start and End Dates? Are you missing any of these check constraints? Run this query to check. This query looks for any columns in the same table that begin with “Start” and “End”. It then looks for check constraints that reference both these columns. If it doesn’t find them, it suggests a check constraint. Don’t blindly run scripts that you got from some random guy’s blog. Even if that someone is me. That’s terribly irresponsible. Notice that I can’t create a constraint on this table because of the night shift. The constraint doesn’t make sense here. Creating constraints on existing tables may take time if the table is huge. Locks may be held on that table for an uncomfortably long time. Of course if your table has data that would violate the constraint, you can’t create it. But now you have to make some other choices. You can correct or delete the offending data or you can add the constraint with NOCHECK.